North Vancouver, B.C., February 28, 2018. 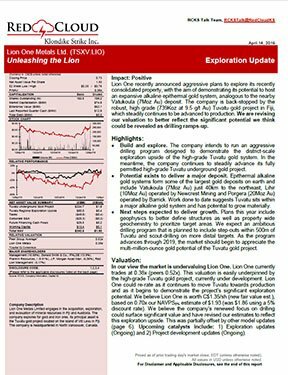 Lion One Metals Limited (TSX-V: LIO) (ASX: LLO) (OTCQX: LOMLF) (FSX: LY1) (the “Company”) announces that a surface sample of 502 g/t gold over 0.70 metres has been returned from the Jomaki prospect 1 km from the planned mill site at its 100% owned and fully permitted Tuvatu Gold Project, now in the development stage, located on the island of Viti Levu in the Republic of Fiji. 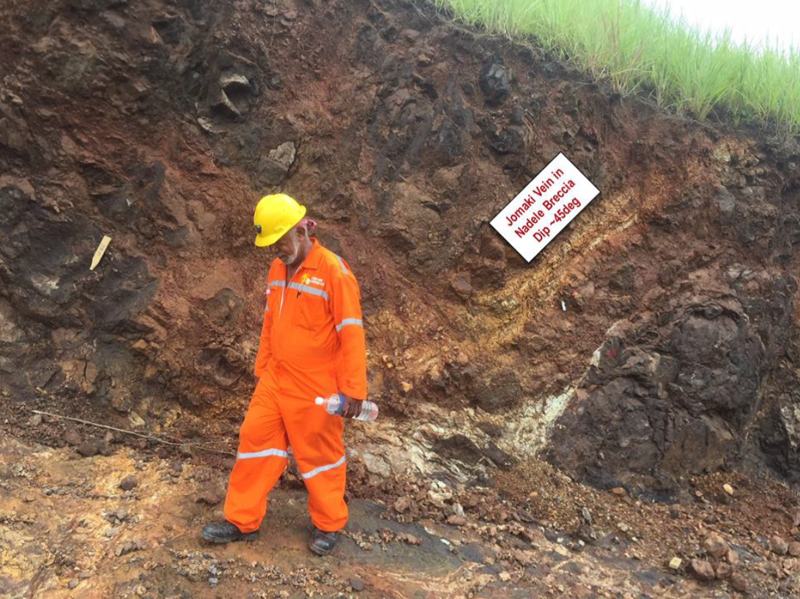 The high grade assay result was returned from bench sampling, and extends the Jomaki prospect, located 1,300 metres south-west of the main mineralized zone at Tuvatu, and 1 km south-west of the planned mill site. 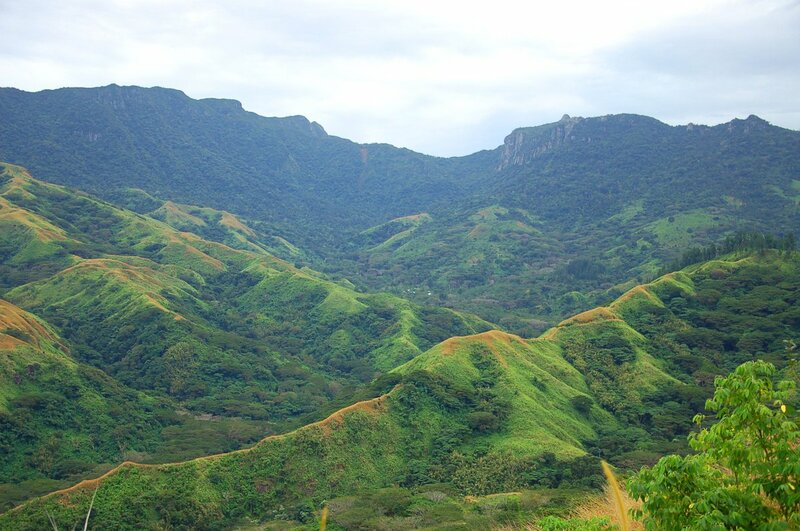 The Jomaki prospect consists of a zone of closely spaced veins that have been mapped over a strike length of 400 metres which remain open to the north and south. This new sample was taken 21 metres east of a previously collected 125 g/t gold result. Both high-grade samples are from steep east dipping veins within the Nadele Breccia (an extrusive volcanic breccia) and near to the contact with the Navilawa Monzonite. 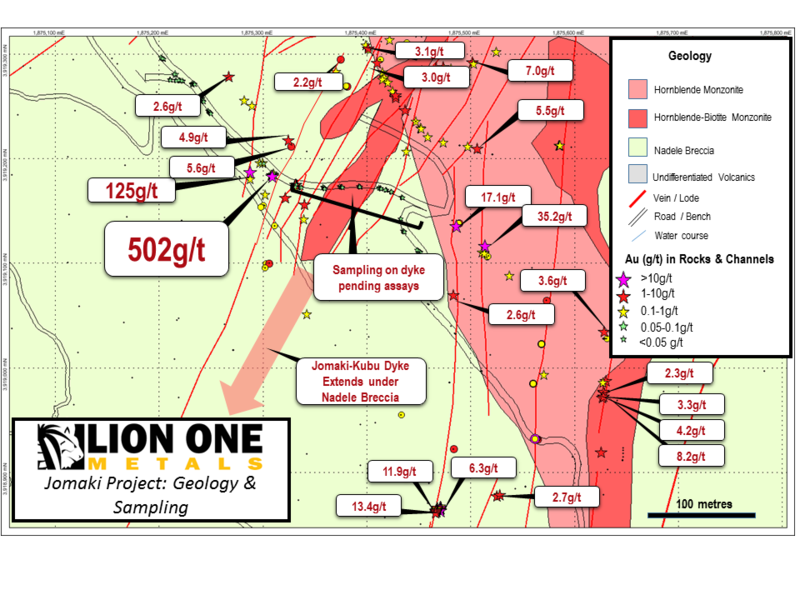 “The objective of Phase One of the 2018 surface exploration program is to confirm zones of high grade gold inside our Mining Lease but distinct from the main zone of mineralization at Tuvatu ”, said Stephen Mann, “We expect to report further results from the 2018 sampling programs soon”. Geology and surface sampling at the Jomaki Prospect (samples > 2g/t labelled). An excavator cuts a bench along the side of a slope to expose the geology. Structures are mapped geologically with areas of potential such as faults and veins recorded. Channel samples are from a hand-cut channel collected across mapped structures with the orientation of the channel being orthogonal (perpendicular) to the orientation of the structure and hence approximate the true-width. Channel Samples were logged, mapped, and placed in sealed bags and shipped to the facilities of ALS Global in Brisbane and Townsville, Australia, for sample preparation and multi-element ICP analysis. Rigorous quality assurance and quality control procedures, including the use of blanks, standards (inserted into the sample stream at a ratio of 1:20) and duplicates, identified no material issues. Samples were pulverized and analysed by a 50g gold fire assay with either an atomic absorption, or gravimetric finish / over-limit dilution method for samples initially reporting over 100 g/t gold. 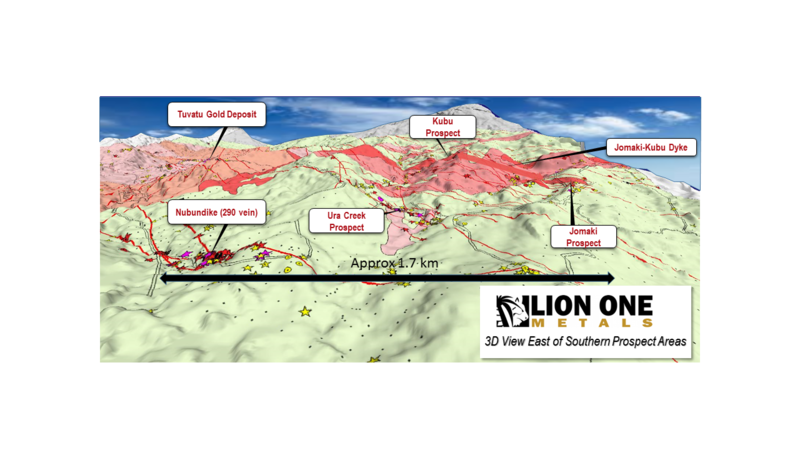 Lion One is aggressively advancing Tuvatu as a near-term production opportunity with exploration upside in the southwest Pacific Ring of Fire. 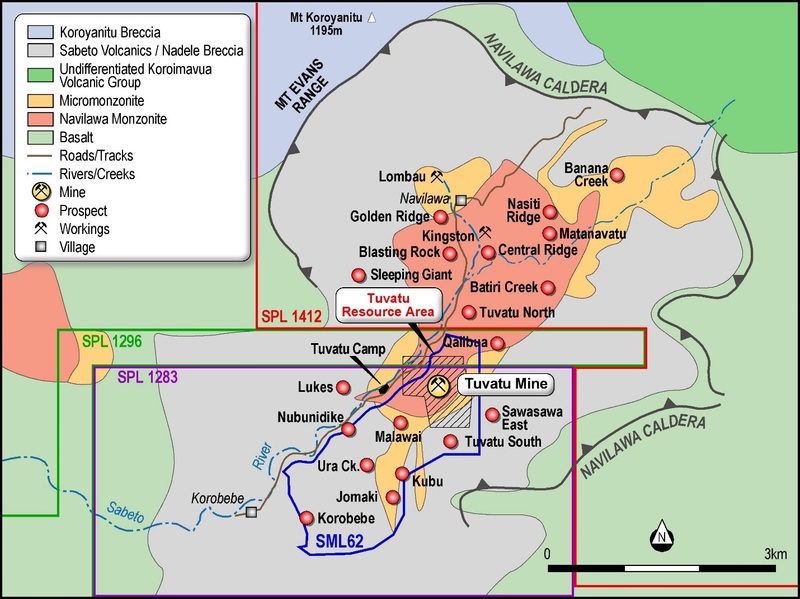 Lion One has modelled Tuvatu for exploration after regional giants in the low sulphidation family of high grade epithermal gold deposits such as Porgera and Lihir in Papua New Guinea, and Vatukoula in Fiji, which boast production of over 35 million ounces of gold in similar alkaline volcanic settings.